IF THIS STORY IS to be something resembling my book of deeds, we must begin at the beginning. At the heart of who I truly am. To do this, you must remember that before I was anything else, I was one of the Edema Ruh. Contrary to popular belief, not all traveling performers are of the Ruh. My troupe was not some poor batch of mummers, japing at crossroads for pennies, singing for our suppers. We were court performers, Lord Greyfallow’s Men. Our arrival in most towns was more of an event than the Midwinter Pageantry and Solinade Games rolled together. There were usually at least eight wagons in our troupe and well over two dozen performers: actors and acrobats, musicians and hand magicians, jugglers and jesters: My family. My father was a better actor and musician than any you have ever seen. My mother had a natural gift for words. They were both beautiful, with dark hair and easy laughter. They were Ruh down to their bones, and that, really, is all that needs to be said. Save perhaps that my mother was a noble before she was a trouper. She told me my father had lured her away from “a miserable dreary hell” with sweet music and sweeter words. I could only assume she meant Three Crossings, where we went to visit relatives when I was very young. Once. My parents were never really married, by which I mean they never bothered making their relationship official with any church. I’m not embarrassed by the fact. They considered themselves married and didn’t see much point in announcing it to any government or God. I respect that. In truth, they seemed more content and faithful than many officially married couples I have seen since. Our patron was Baron Greyfallow, and his name opened many doors that would ordinarily be closed to the Edema Ruh. In return we wore his colors, green and grey, and added to his reputation wherever we went. Once a year we spent two span at his manor, entertaining him and his household. It was a happy childhood, growing up in the center of an endless fair. My father would read to me from the great monologues during the long wagon rides between towns. Reciting mostly from memory, his voice would roll down the road for a quarter mile. I remember reading along, coming in on the secondary parts. My father would encourage me to try particularly good sections myself, and I learned to love the feel of good words. My mother and I would make up songs together. Other times my parents would act out romantic dialogues while I followed along in the books. They seemed like games at the time. Little did I know how cunningly I was being taught. I was a curious child: quick with questions and eager to learn. With acrobats and actors as my teachers, it is little wonder that I never grew to dread lessons as most children do. The roads were safer in those days, but cautious folk would still travel with our troupe for safety’s sake. They supplemented my education. I learned an eclectic smattering of Commonwealth law from a traveling barrister too drunk or too pompous to realize he was lecturing an eight-year-old. I learned woodcraft from a huntsman named Laclith who traveled with us for nearly a whole season. Hetera smelled vaguely of cinnamon, and at nine years old I found her fascinating without exactly knowing why. She taught me I should never do anything in private that I didn’t want talked about in public, and cautioned me to not talk in my sleep. And then there was Abenthy, my first real teacher. He taught me more than all the others set end to end. If not for him, I would never have become the man I am today. I ask that you not hold it against him. He meant well. By this time our wagons were drawing attention. Trip was doing some juggling. Marion and his wife were putting on an impromptu string-puppet show. I was watching my father from the back of our wagon. Now you have to understand that twenty pennies might be a good bit of money for some little ragamuffin troupe living hand-to-mouth. But for us it was simply insulting. He should have offered us forty to play for the evening, free use of the public hall, a good meal, and beds at the inn. The last we would graciously decline, as their beds were no doubt lousy and those in our wagons were not. If my father was surprised or insulted, he did not show it. “Pack up!” He shouted over one shoulder. Trip tucked his juggling stones into various pockets without so much as a flourish. There was a disappointed chorus from several dozen townsfolk as the puppets stopped midjape and were packed away. The mayor looked relieved, brought out his purse, and pulled out two silver pennies. “I’ll be sure to tell the baron of your generosity,” my father said carefully as the mayor lay the pennies into his hand. I watched as the mayor read it. It took him a little while, as my father had not bothered to mention the majority of the baron’s titles such as the Viscount of Montrone and Lord of Trelliston. The upshot was this: it was true that the Squire Semelan controlled this little town and all the land around it, but Semelan owed fealty directly to Greyfallow. In more concrete terms, Greyfallow was captain of the ship; Semelan scrubbed the planking and saluted him. That was all. I remember being stunned when the mayor didn’t apologize or offer my father more money. The mayor hesitated, though I could hardly believe it. We sometimes chose to play on the green because the local buildings weren’t big enough. Two of our wagons were built to become stages for just that eventuality. But in my whole eleven years of memory I could barely count on both hands the times we’d been forced to play the green. We had never played outside the city limits. I was outraged. I waited for my father to show the mayor the sharp side of his tongue, to explain the difference between mere traveling performers and Edema Ruh. We didn’t steal. We would never let things get so out of control that a bunch of drunks ruined the hall where we were playing. But my father did nothing of the sort, he just nodded and walked back toward our wagon. He gestured and Trip started juggling again. The puppets reemerged from their cases. That was the hardest part of growing up Edema Ruh. We are strangers everywhere. Many folk view us as vagabonds and beggars, while others deem us little more than thieves, heretics, and whores. It’s hard to be wrongfully accused, but it’s worse when the people looking down on you are clods who have never read a book or traveled more than twenty miles from the place they were born. “He’s an ignorant blatherskate,” I said bitterly. He lay a firm hand on my shoulder, letting me know I’d said enough. “This is what comes of getting too close to Atur, I suppose. Tomorrow we’ll head south: greener pastures, kinder folk, prettier women.” He cupped an ear toward the wagon and nudged me with his elbow. “I can hear everything you say,” my mother called sweetly from inside. My father grinned and winked at me. “Like playing in the rain and getting shimmed on the deal?” I asked. The mayor smiled and hurried away. Trip had the quickest tongue of anyone in the troupe, which made him the best man for the job of making sure no one tried to fast-talk or bully their way inside. Wearing his green and grey jester’s motley, Trip could say just about anything and get away with it. Though it was always fun to watch Trip work, most of my attention was on a wagon that had rolled into the other end of town about a quarter hour ago. The mayor had argued with the old man driving it, then stormed off. Now I saw the mayor heading back to the wagon accompanied by a tall fellow carrying a long cudgel, the constable unless I missed my guess. My curiosity got the best of me and I made my way toward the wagon, doing my best to stay out of sight. The mayor and the old man were arguing again by the time I got close enough to hear. The constable stood nearby, looking irritated and anxious. Fear flashed across the mayor’s face before it was overwhelmed by outrage. He gestured over one shoulder at the constable. “Then you’ll spend the night in jail for vagrancy and threatening behavior. We’ll let you on your way in the morning if you’ve learned to keep a civil tongue in your head.” The constable advanced on the wagon, his cudgel held cautiously at his side. After a moment’s surprise, I realized the strange light came from a pair of sympathy lamps the old man had mounted on his wagon. I had seen one before, in Lord Greyfallow’s library. They were brighter than gaslight, steadier than candles or lamps, and lasted nearly forever. They were also terribly expensive. I was willing to bet that no one in this little town had ever heard of them, let alone seen one. The constable stopped in his tracks when the light began to swell. But when nothing else seemed to happen, he set his jaw and kept walking toward the wagon. The constable grinned and twisted the old man’s arm. The arcanist bent at the waist and gasped a short, painful breath. From where I hid, I saw the arcanist’s face change from anxious, to pained, to angry all in a second. I saw his mouth move. A furious gust of wind came out of nowhere, as if a storm had suddenly burst with no warning. The wind struck the old man’s wagon and it tipped onto two wheels before slamming back down onto four. The constable staggered and fell as if he had been struck by the hand of God. Even where I hid nearly thirty feet away the wind was so strong that I was forced to take a step forward, as if I’d been pushed roughly from behind. “Begone!” the old man shouted angrily. “Trouble me no longer! I will set fire to your blood and fill you with a fear like ice and iron!” There was something familiar about his words, but I couldn’t put my finger on it. Both the mayor and the constable turned tail and ran, their eyes white and wild as startled horses’. The wind faded as quickly as it had come. The whole sudden burst couldn’t have lasted more than five seconds. As most of the townsfolk were gathered around the public house, I doubted anyone had seen it except for me, the mayor, the constable, and the old man’s donkeys who stood placidly in their harness, utterly unperturbed. For a second I thought the old man was talking to me. Then I realized the truth. He was talking to his donkeys. He clambered up into the back of the wagon and came down with a wide bucket and a nearly empty burlap sack. He upended the sack into the bucket and seemed disheartened by the results. He took out a handful for himself before nudging the bucket toward the donkeys with his foot. “Don’t give me that look,” he said to them. “It’s short rations all around. Besides, you can graze.” He petted one donkey while he ate his handful of rough oats, stopping occasionally to spit out a husk. It struck me as very sad, this old man all alone on the road with no one to talk to but his donkeys. It’s hard for us Edema Ruh, but at least we had each other. This man had no one. Rare Goods. All Alements Tended. Lost Items Found. Anything Mended. No Horoscopes. No Love Potions. No Malefaction. “You’ve misspelled ‘ailments’,” I pointed out. “I’d like some lacillium.” We had performed Farien the Fair a dozen times in the last month, and it had filled my young mind with intrigue and assassination. “Are you expecting someone to poison you?” he said, somewhat taken aback. “Oh,” I said. “I didn’t know that.” In the play it was touted as an infallible cure-all. I nodded, not seeing any point in false modesty. I didn’t have to think too hard about it; candles were expensive and vulnerable to drafts, torches were dirty and dangerous. And everyone in the troupe learned the dangers of cosmetics at an early age. It was hard to become an old, seasoned trouper when you painted poison on yourself every third day and ended up raving mad by the time you were twenty-five. If this is to be a full and honest account of my life and deeds, I feel I should mention that my reasons for inviting Ben into our troupe were not entirely altruistic. It’s true that quality cosmetics and clean lights were a welcome addition to our troupe. It’s also true that I’d felt sorry for the old man alone on the road. But underneath it all I was moved by my curiosity. I had seen Abenthy do something I could not explain, something strange and wonderful. Not his trick with the sympathy lamps—I recognized that for what it was: showmanship, a bluff to impress ignorant townsfolk. What he had done afterward was different. He called the wind and the wind came. It was magic. Real magic. The sort of magic I’d heard about in stories of Taborlin the Great. The sort of magic I hadn’t believed in since I was six. Now I didn’t know what to believe. So I invited him into our troupe, hoping to find answers to my questions. 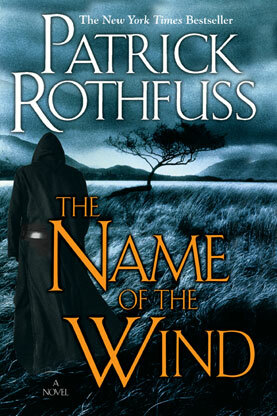 Though I didn’t know it at the time, I was looking for the name of the wind. ABENTHY WAS THE FIRST arcanist I ever met, a strange, exciting figure to a young boy. He was knowledgeable in all the sciences: botany, astronomy, psychology, anatomy, alchemy, geology, chemistry. . . . He was portly, with twinkling eyes that moved quickly from one thing to another. He had a strip of dark grey hair running around the back of his head, but (and this is what I remember most about him) no eyebrows. Rather, he had them, but they were in a perpetual state of regrowing from being burned off in the course of his alchemical pursuits. It made him look surprised and quizzical all at once. He spoke gently, laughed often, and never exercised his wit at the expense of others. He cursed like a drunken sailor with a broken leg, but only at his donkeys. They were called Alpha and Beta, and Abenthy fed them carrots and lumps of sugar when he thought no one was looking. Chemistry was his particular love, and my father said he’d never known a man to run a better still. By his second day in our troupe I was making a habit of riding in his wagon. I would ask him questions and he would answer. Then he would ask for songs and I would pluck them out for him on a lute I borrowed from my father’s wagon. He would even sing from time to time. He had a bright, reckless tenor that was always wandering off, looking for notes in the wrong places. More often than not he stopped and laughed at himself when it happened. He was a good man, and there was no conceit in him. Not long after he joined our troupe, I asked Abenthy what it was like being an arcanist. “What’s the difference?” I asked, sensing it was expected of me. Abenthy gave me an appraising look. I’d been waiting for it. It was the look that said, “You don’t sound as young as you look.” I hoped he’d come to grips with it fairly soon. It gets tiresome being spoken to as if you are a child, even if you happen to be one. “Sympathy?” I interrupted as politely as possible. At his mention of the Arcanum, I bristled with two dozen new questions. Not so many, you might think, but when you added them to the half-hundred questions I carried with me wherever I went, I was stretched nearly to bursting. Only through a severe effort of will did I remain silent, waiting for Abenthy to continue on his own. He answered the last question, the others having rushed by too quickly for him to respond. “More than a thousand, actually. Ten times ten thousand books. More than that. More books than you could ever read.” Abenthy’s voice grew vaguely wistful. More books than I could read? Somehow I doubted that. Ben continued. “The people you see riding with caravans—charmers who keep food from spoiling, dowsers, fortune-tellers, toad eaters—aren’t real arcanists any more than all traveling performers are Edema Ruh. They might know a little alchemy, a little sympathy, a little medicine.” He shook his head. “But they’re not arcanists. Abenthy pulled a fine chain over his head and handed it to me. It was the first time I had ever seen an Arcanum guilder. It looked rather unimpressive, just a flat piece of lead with some unfamiliar writing stamped onto it. I gritted my teeth and nodded. My hand had gone numb as soon as I’d touched it. I was curious to study the markings on its front and back, but after the space of two breaths, my arm was numb to the shoulder, as if I had slept on it all night. I wondered if my whole body would go numb if I held it long enough. I was prevented from finding out, as the wagon hit a bump and my numbed hand almost let Abenthy’s guilder fall to the footboard of the wagon. He snatched it up and slipped it back over his head, chuckling. “How can you stand it?” I asked, trying to rub a little feeling back into my hand. “That’s a little different,” Abenthy laughed. “Not anything so unexplainable as a knack.” He slouched a little farther down into his seat. “Probably for the best. A couple hundred years ago, a person was good as dead if folk saw he had a knack. The Tehlins called them demon signs, and burned folk if they had them.” Abenthy’s mood seemed to have taken a downward turn. He shrugged. “Knacks don’t go away so easily as that. When I was growing up in Staup, I knew a young man with a knack. Uncommonly good with plants.” Abenthy’s grin was gone as he looked off at something I couldn’t see. “His tomatoes would be red while everyone else’s vines were still climbing. His squash were bigger and sweeter, his grapes didn’t hardly have to be bottled before they started being wine.” He trailed off, his eyes far away. “Did they burn him?” I asked with the morbid curiosity of the young. There was a moment of silence. Two wagons ahead of us, I heard Teren and Shandi rehearsing lines from The Swineherd and the Nightingale. Abenthy seemed to be listening as well, in an offhand way. After Teren got himself lost halfway through Fain’s garden monologue, I turned back to face him. “Do they teach acting at the University?” I asked. I looked over at Abenthy and saw him watching me, his eyes danced. “Could you teach me some of those other things?” I asked. He smiled, and it was as easy as that.